Five-star Dublin hotel afternoon tea – for when you want to wear your fancy pants. Afternoon tea is a British tradition popularised in the ninetieth century by Anna, the 7th Duchess of Bedford. Apparently the Duchess had a ‘sinking feeling’ during the afternoon. This was because there was such a long gap between the two main meals of the day, breakfast and dinner. So she began having a pot of tea and a light snack in her boudoir in the afternoon. Before long it was adopted by the fashionable society who began sipping tea and nibbling sandwiches in the middle of the afternoon. Of course, this tradition hit Irish shores and we adopted it and made it our own. And it would seem that afternoon tea is just as popular today as it was back in the nineteenth century. There are no set rules for serving afternoon tea but most places seem to serve a selection of delicate finger sandwiches, scones with cream and jam and elegant sweet treats and cakes. Tea is of course the drink of choice with many varieties to choose from but Champagne afternoon tea is also very popular. You can of course have coffee or any other drink you wish but pouring tea from a china teapot is all part of the charm of a good afternoon tea. You can find afternoon teas all over the city but having a Dublin hotel afternoon tea in the dining or drawing-room of a five-star luxury hotel adds to the experience and occasion of afternoon tea. So if you are looking for an exquisite experience, here are my best five-star Dublin hotel afternoon tea treats. Irish author Jonathan Swift wrote Gulliver’s Travels and Lemuls restaurant in The Conrad Hotel is named after the fictional traveller. The afternoon tea in Lemuls is inspired by the book and you can have a Lemuel’s Afternoon Tea €38pp, Lemuel’s Story Teller Cocktail Afternoon Tea €46pp or Lemuel’s Champagne Afternoon Tea €52pp. One of the highlights is ‘Up in the Clouds’ a passionfruit purée, white chocolate mousse and chocolate rocks, inspired by the ying island of Laputa, with candy floss as clouds and chocolate rocks representing the custom of locals throwing rocks at rebellious cities. I could eat three tiers of this alone. The elegant surroundings of The Merrion Hotel’s Drawing Rooms are the perfect place to relax for an afternoon tea. The Merrion Hotel Art Afternoon Tea is based on 19th and 20th-century art by J.B Yeats, William Scott, Louis Le Brocquy and others. The ‘Art Tea’ arrives on fine china and one of the highlights is the ‘Futile Defense’ raspberry and passion fruit tart. This is based on Fabricated Evidence by John Boyd. 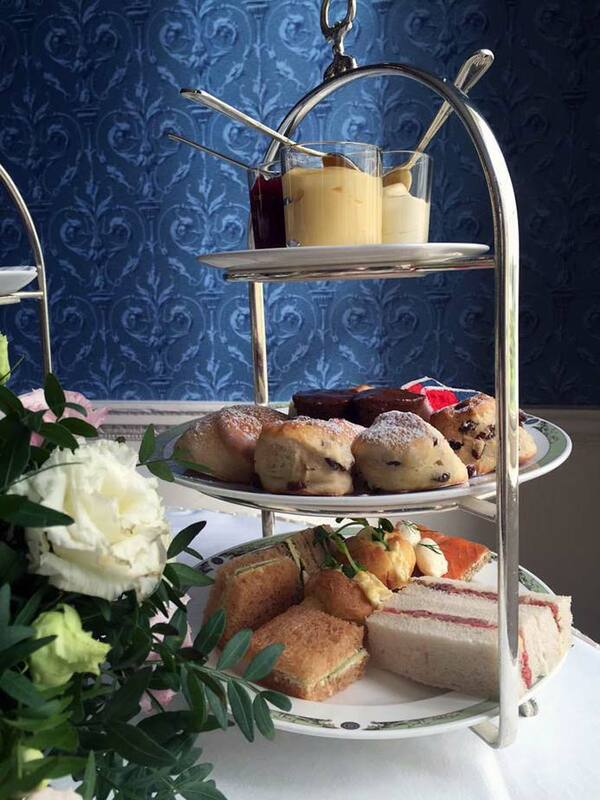 Afternoon tea in the Merrion Hotel costs €45.00 per person or €57.50 per person with a glass of Ruinart NV Champagne. In the Shelbourne Hotel you can relax in the Lord Mayor’s Lounge and indulge in a traditional afternoon tea. There’s also a Children’s Afternoon Tea designed specifically for little ones who love to lunch. One of the highlights of the Shelbourne Hotel Afternoon Tea is the sherry trifle spiked with Harvey’s Bristol Cream. The classic afternoon tea in the Lord Mayor’s Lounge in the Shelbourne Hotel is €49 per person or €64 for Champagne afternoon tea. In the Westbury Hotel you can relax and sink back into one of the comfortable armchairs or sofas and sip tea poured from silver teapots whilst watching the hustle and bustle of Grafton Street. The Westbury also does a children’s afternoon tea so you can introduce the little ones to this most wonderful delicacy. One of the highlights of this afternoon tea is from the savoury tier. Wait till you try the oak smoked salmon and crab open sandwich served on homemade soda bread with lemon aioli. It is so fresh and flavourful and perfectly balanced. 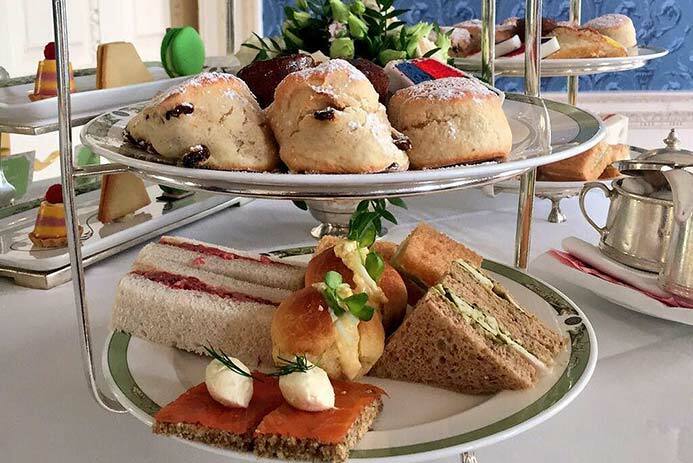 The Westbury Afternoon tea cost €50 or €65 for a champagne afternoon tea with Perrier-Jouët Grand Brut NV or Perrier-Jouët Blason Rosé or it’s €80 for a Dom Pérignon Champagne afternoon tea. Relax in the oasis of tranquillity of the Atrium Lounge in the Westin Hotel under the five-story high glass ceiling. Get cozy by the fire and enjoy A Most Peculiar Afternoon Tea. This comes with a Hendrick’s gin cocktail or you can stick with the traditional afternoon tea menu. One of the highlights of the afternoon tea is the passion fruit panna cotta with fresh berry compote. A Most Peculiar Afternoon Tea cost €44, the traditional afternoon tea costs €42 and you can add a homemade cocktail for a supplement of €8.50. So what did you think of my five-star Dublin hotel afternoon tea blog post? Did your favourite afternoon tea make the list? Is there somewhere you would recommend me to check out? Let me know in the comments below. I love hearing from you. If you liked this post you may also like my Best Nachos in Dublin – The Suburban Edition. And my post on the best places in Dublin to eat gambas al aioli tapas. You may also like my review of afternoon tea in the stunning Cafe Townhouse Doneraile. And check out my review of afternoon tea in the Pullman Restaurant in the Glenlo Abbey Hotel in Galway. If you like this five-star Dublin hotel afternoon tea blog post, please share with others. They are all so good. Such a lovely treat. Everything looks great, but my winner is The Merrion Hotel. It looks delicious. It is such a creative afternoon tea and the hotel itself is so relaxing and comfortable. It is one of my favourites. Oh, If you need any Dublin travel tips, let me know. I have loads. It would be such a treat to stay in one of these hotels but even an afternoon tea would be very special. Enjoy your time in Dublin. Afternoon teas are something that I really enjoy and finding ones that offer a good variety and choice is important. Reading posts like these with good recommendations is really useful. I love choice too. Some teas are very limited. These are all very creative with lots of different tastes and textures and they are great for vegetarians as they have plenty of substitutes for the meat sandwiches. Despite loving everything on the menu, I have still to this day never gone out for afternoon tea before! I’ve heard a lot about them, and how lovely and elegant they are, and this post just makes me want to experience it even more! Hopefully one day I will get the chance. You should treat yourself. You don’t have to go to a fancy hotel. Loads of places do afternoon tea nowadays. If you do come to Dublin, let me know and I’ll give you some great travel tips. I have always wanted to visit Dublin and hope to one day!! This looks like a gorgeous place to visit. Great post! If you ever come over, let me know and I’ll give you some travel tips and places to eat and visit. Yes, there is a lot of food but in Ireland you can take away what you don’t eat and have it later on!